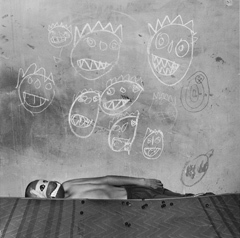 Stills Gallery is delighted to be the first Australian gallery to exhibit the work of internationally acclaimed photographer Roger Ballen. Ballen is perhaps best known for his striking photographs of people on the fringes of South African society explored in publications such as Dorps, Small Towns of South Africa; Platteland, Images from Rural South Africa and Outland. In his most recent book, Shadow Chamber, published by Phaidon, his focus has shifted more into the metaphoric realm. He has created a way of seeing that makes an important and historic contribution to art photography. Ballen makes images that are ambiguous and often disturbing, but that are also shot through with flashes of dark humour. The photographs in Shadow Chamber blur the boundaries between documentary photography and art forms such as painting, theatre and sculpture, challenging the ways in which we perceive the 'reality' of photography. They are completely honest, and yet also fabricated. The mysterious, cell-like rooms he photographs are actual places, but they are unsettling and strange, logical but utterly impossible: their walls are covered with scribbled drawings, stains and dangling wires, the floors are strewn with bizarre props and artifacts. Dogs, rabbits and kittens wander into the frame or are stuffed into unlikely containers. The humans and animals in Ballen's photographs appear isolated and lost, yet strangely empowered at the same time. The resulting images are allegories of lived experiences as well as surreal takes on human destiny. Ballen's photographs are held in the collections of the Museum of Modern Art, New York; the Centre Georges Pompidou, Paris; the Victoria & Albert Museum, London and the Stedelijk Museum, Amsterdam. He has won numerous awards, including the prize for Best Photographic Book of the Year at the PhotoEspana festival in Madrid and was named Photographer of the Year at the inaugural Rencontres de la photographie d'Arles in France. Works from Shadow Chamber and Outland have been shown in galleries worldwide.